Water nears the garage of a home on Sam Rayburn Reservoir on Sunday afternoon. JASPER COUNTY, Texas — A number of camping and boat ramp facilities are closed at Sam Rayburn Reservoir and B.A. Steinhagen/Dam B due to the recent rainfall. FORT WORTH, Texas –U.S. Army Corps of Engineers’ representatives at Sam Rayburn Reservoir announce that current high lake levels have resulted in additional facility closures at Sam Rayburn Reservoir related to recent rainfall events. U.S. Army Corps of Engineers personnel have been and continue to monitor lake levels and the associated impact to recreational facilities. Recreational areas will be opened as soon as conditions allow. Currently, the only open U.S. Army Corps of Engineer’s managed boat ramps are located at Ralph McAlister Park and Twin Dikes Public (near Umphrey’s Family Pavilion). 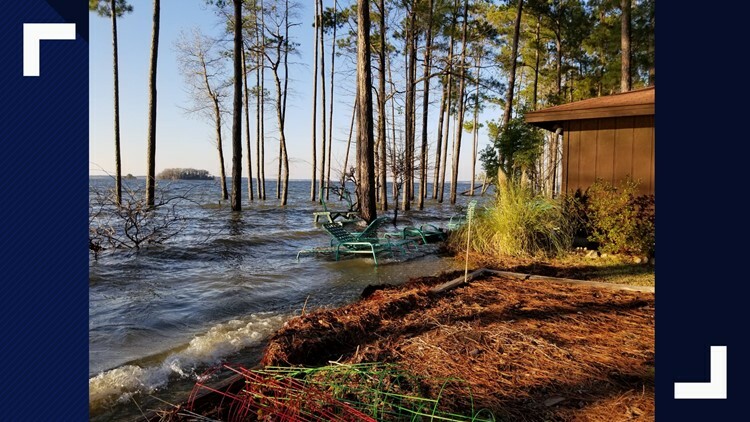 Additional camping and/or boat launching opportunities may be found at Cassells-Boykin Park, Powell Park Marina, Jackson Hill Park and Marina, Shirley Creek Park and Marina, and the Sam Rayburn Resort and Marina. Please contact each facility prior to visiting to ensure availability. Not all additionally listed locations provide boat launching opportunities at this time. Sam Rayburn Reservoir continues to hold flood waters and although forecasted lake elevation may approach 175 feet, release of flood water will be through the Powerhouse. Current releases are being made through power generation with daily releases for peak power equating to 5,500 cubic feet per second. Hours of operations and flood releases may be adjusted at any time. Current release schedule for Town Bluff/Dam B/B.A. Steinhagen is forecasted not to exceed 25,000 cubic feet per second. At this time, recreational areas are not impacted. Additional rain in the watershed or change in release amounts at Sam Rayburn will cause changes in releases at Town Bluff. All water safety measures must be adhered to when on or near the water. Life vests are a must! Large water discharges and changing lake levels will present new hazards at or just below the water line. Be vigilant and constantly aware of changing conditions and hazards. Newly submerged hazards can cause serious damage or injury.